The Long Jump is one of the last great personal challenges. Forget your altitude records, round the world flights and competition flying, all very challenging to different degrees I’m sure, but The Great British Long Jump is truly a personal challenge and one that has seen some pretty courageous flying over the years. Last year was no exception and for those of you that haven’t read the reports on the GBLG website you are missing a treat. 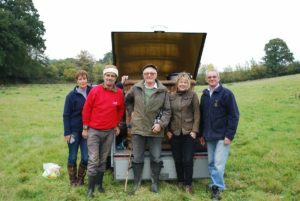 The longest flight was snatched from the youngsters by Mr David Bareford who zoomed solo, 260 miles across the country, from Whitland in Carmarthenshire to Kirstead in Norfolk in just over eight hours. Robert Lovell and Adam Griffiths went the other way culminating in a well-hairy landing following an altercation with a tree which put Adam in Merthyr Tydfyll hospital. 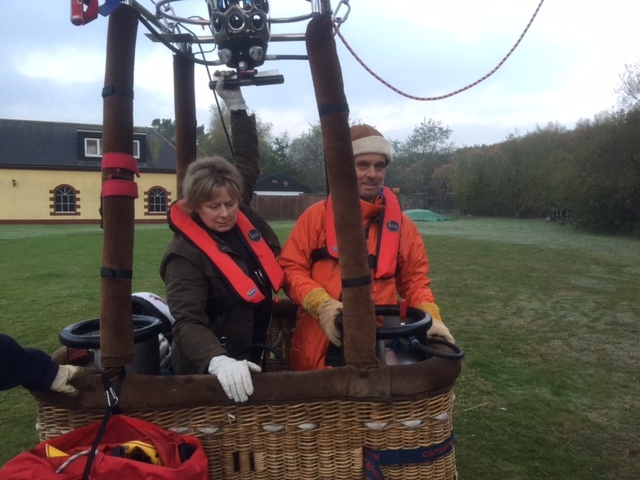 It is as adventurous as you want it to be and our prize for last years’ Jump would most certainly have gone to Debbie Day and her co-pilot Mike Scholes. They decided to fly along the south coast and, to be perfectly honest, if this flight doesn’t inspire you I have no idea what will or would. The event takes place in October and its all down to you. The rules of entry have now changed so entry can be any time up until you ‘go for it’! Here is Debbie’s account of their adventure. Clicking on the piccies should show them fullsize. Great fun, exciting, challenging and often outside my comfort zone, this year October had many days on which we could have flown but we missed out at the beginning through commitments but in the middle of October drove up to Norfolk to stay in the Fritton Arms near Great Yarmouth. The forecast looked good for easterlies to take us across to South Wales and follow the likes of Dominic and Stephanie Bareford in the 2015 Long Jump. The Met office advised that there was a five percent chance of rain so on that forecast we were expecting good weather, unfortunately we were covered by intermittent and heavy showers which, when they cleared, were visible to the north and south of the track so as a result the flight was cancelled. I did wonder whether there was any need to drive 150 miles and stay overnight somewhere, I remembered reading two Long Jump reports of flights in Southern England, one from West Meon in Hampshire to Kent and the other from North Kent going west between the Gatwick and Heathrow zones. If they could do it then perhaps that would be an opportunity for me to do the same. Sure enough the long range BBC weather reports showed isobars running parallel with the south coast and diminishing further northwards. 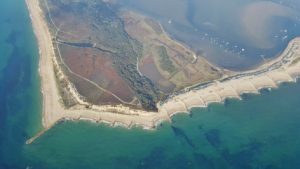 We started to watch these reports regularly and sure enough they remained consistent as did weather online and reports from our forecaster meant the potential for a flight along the south coast grew. Preparations were made, lifejackets were bought and equipment installed in the balloon such as the transponder and spare radios. 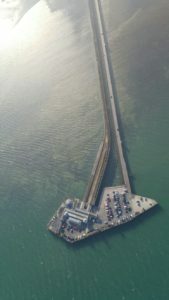 Potential launch sites were contacted however none was able to help so Celia looked on Google Earth and identified the Eastbourne Miniature Steam Railway. 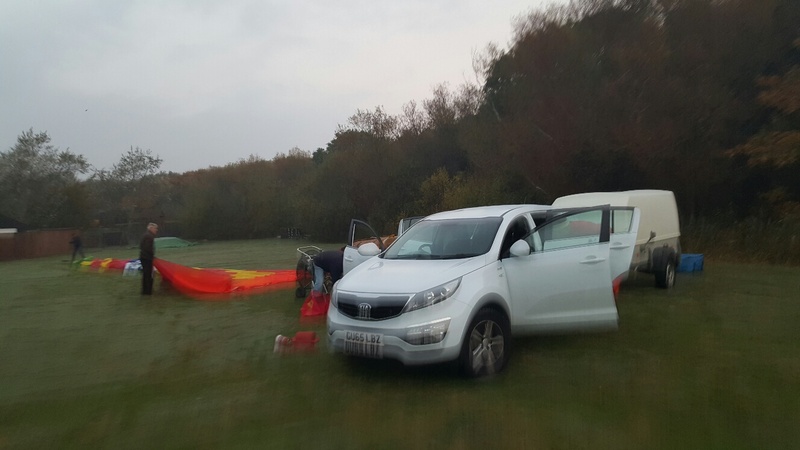 Mike called the railway and was pleased to be told that they had a large grassed area in front of the main entrance with shelter from some trees so later that day Celia and Mike drove down and found that this was an excellent launchsite and everybody was happy. That evening Mike contacted the Coast Guard to advise that a balloon would be flying along the coast so no need to be alarmed if calls were made by concerned members of the public. He also phoned Bournemouth and Southampton Airport to see if access through their air traffic zones would be possible should it be necessary. Bournemouth advised that we would be classed as a transit aircraft and it wouldn't be a problem. Southampton advised that we would be flying under their approach route as the wind was from the north side. We were told to call when we reached Thorny Island but they did not envisage a problem. On the Sunday morning we arrived at the miniature railway at 07:00 hours and began setting up with the assistance of Ian, Hannah, Celia and Peter also Mr Wadey a locomotive driver and the railway’s owner along with his family. The site was absolutely ideal and gradually the balloon came together whilst Mike and I donned dry suits and life jackets on top of warm clothing, having already secured the pilot restraints and cycle helmets for landing something we have always done for longer flights and now do routinely. 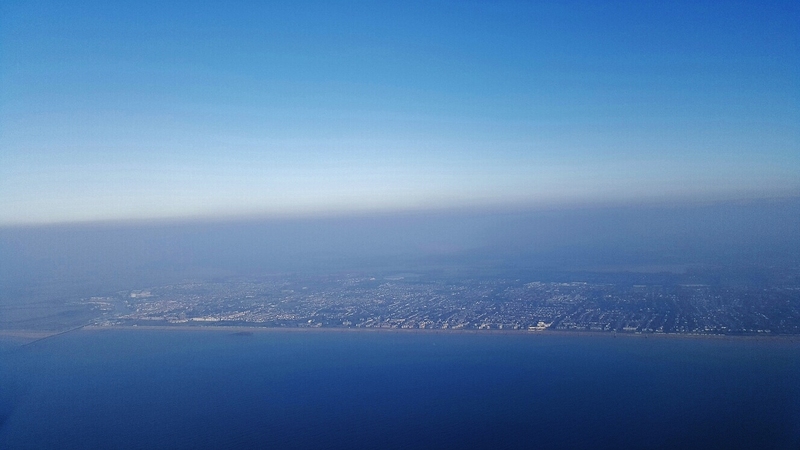 Take off went very smoothly with an initial track of 250° taking us over Eastbourne. This was ideal as we were flying with a banner advertising ‘More Radio’ which is the new name for the local radio station. 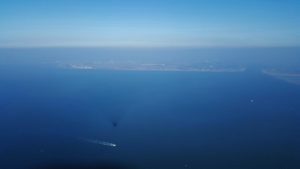 Our speed over Eastbourne was approximately 20knots and at around 250 feet we headed over the Downs behind Beachy Head and crossed the coastline just east of Burning Gap to set out over The Channel. The visibility was only five kilometres so I decided it would be better to climb and at around 1600 feet we were in bright sunshine, much better and resulting in a more economic flight, however the direction was not quite as we wished so had to descend a little in order to track towards Worthing, another town that is covered by the radio station, tracking gently towards Worthing our speed dropped to only 16 knots. Its hardly a long jump speed, however we persisted as the track was very good and taking us south of Newhaven Harbour, Brighton Centre, Shoreham Airport and on towards Worthing. We didn't quite make Worthing but we came very close to the shore just west of Worthing at Rustington then back up to higher level we were travelling much better at 23 knots along the Coast. Selsey Bill came into view an amazing flat land that points out into The Channel. We were amazed to see that the area was covered with fields of solar panels running about half a mile inland from the Point. We were now heading due west. 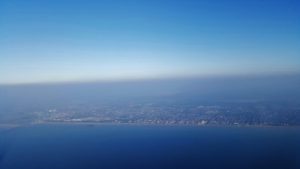 This meant that we would be clear of Southampton's airspace, clear of the Lee-on-Solent gliding area and clear of other airspace provided we didn't go above 2000 feet. 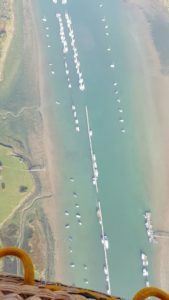 It was great looking down at the Solent, one of the ancient forts was clearly visible with a large ship sailing relatively close. Then it was on to the Isle of Wight and, as requested, Mike tried to contact Southampton air traffic but could not get a response so using the second radio he contacted Bembridge who were pleased to hear from us and advise that the circuit was 1000 feet, so we kept at 1200 feet although we anticipated being clear of their zone we could hear aircraft landing at Southampton and being told that the wind was ‘060 5’. It was then we heard an aircraft been given landing instructions for Bembridge ‘060 18’. What a difference being inland made to the windspeed! We arrived at the Isle of Wight flying right over the northern end of Ryde Pier just where the cross-Solent ferries berth. 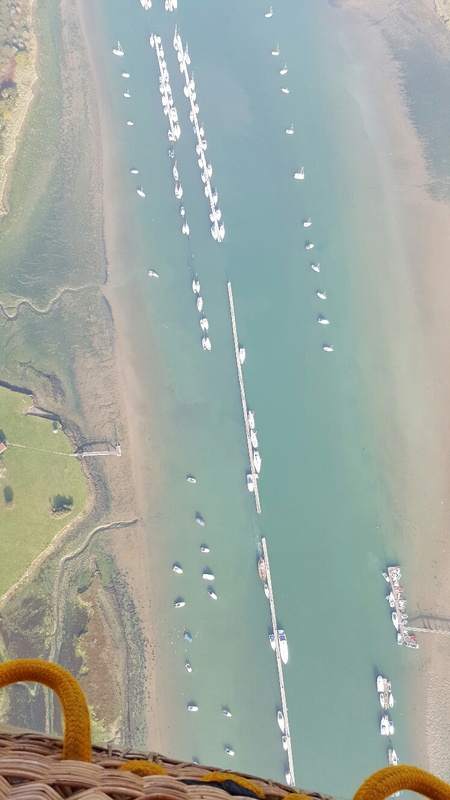 Flying on towards Cowes there was a fantastic view of the yachts moored in lines and just after that we came ashore and passed south of Fishborne. The Isle of Wight was much larger than we realised and it took some time to actually cross the land mass. Leaving the Isle of Wight we were then able to climb higher as we were now clear of the airway. We left Southampton Airport and approached the mainland the Visual Reporting Point of Hearst Castle. 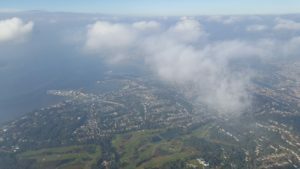 Bournemouth ATC was called and they advised that we should remain between 2000 and 3000 feet as we were tracking west along the coast, aircraft tracking East would be beneath, or above, us. We were to call at the next VRP which we duly did. We heard other aircraft contacting Bournemouth and were relieved to hear Bournemouth weather being ‘060 12’, quite an acceptable speed for landing so things were looking good. Bournemouth kindly contacted us to advise that the Danger Areas, to which we intended to pass north of, were not active. Our flight continued inland and we cleared to the north of Brownsea Island and our track remained very good on 265° to 270°. Clearing Brownsea we had to climb to over 3500 thousand feet because of broken low cloud caused by the wind being on to the shore. This enabled us to stay in the sun and keep the fuel consumption down. Shortly after settling at this height we were rather alarmed to hear mortars, gunfire, helicopters flying and all sorts of military activity! Mike contacted Bournemouth ATC again and was told that they weren't aware of any military activity and would check with the London Flight Information Service. They called back. Both had no knowledge of this military activity but, as a precaution, we had already climbed to 4800 feet and everything went quiet again, much to our relief. 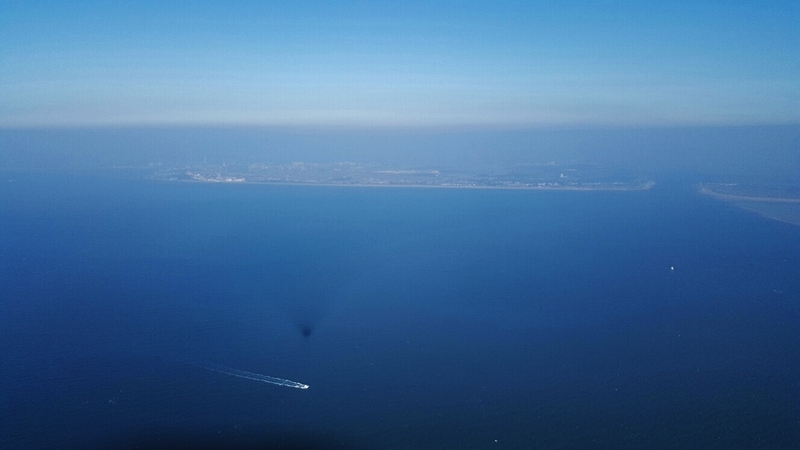 After passing overhead Dorchester we cleared Lyme Bay to the North still keeping clear of the Danger Area just in case things were not as quiet as anticipated. Mike contacted Exeter and advised that we would be passing North of their field by about three miles. Our speed at 3000 feet had picked up to over 30 knots its and so we had an hour at much more of a Long Jump speed. I noticed, in the distance to the west, high level cloud forming. This was exactly as forecast and our plan was to land by mid afternoon ahead of the approaching windier whether. I descended to 2000 feet in order to obtain the best track of 290° to take us over the M5 north of Exeter towards Okehampton. The track would give us the best possible area to land, relatively flat, gently undulating land, rather than going down just after Exeter which would take us towards Dartmoor. Exeter air traffic was very concerned as it had just received a strong weather warning from the Met Office. Their current weather was 18 knots gusting 30! 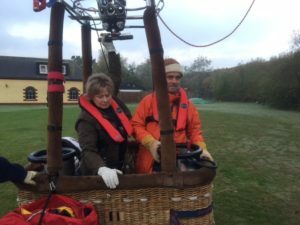 On hearing the windspeed the pilot of a departing helicopter radioed that we were braver than he to be flying a balloon in this wind! Taking heed, 20 minutes later I descended to around 200 feet above ground where the windspeed was 18 to 22 knots. Then came the windshear which severely dished the envelope. I then had to put lots of heat in to stabilise it. 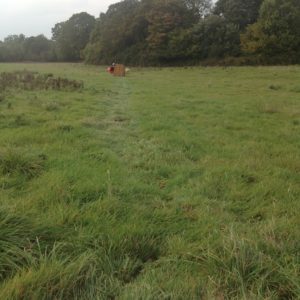 We tracked overhead a railway line for over a mile before the line turned to the right and, on clearing some tall trees, a small field appeared and I popped the balloon down with a fairly rapid descent and slid along the ground for approximately 68 of my paces, the length of the field! Coming to a halt we unscrambled ourselves undid pilot restraints, removed the helmets and breathed sighs of relief It had been my most challenging landing to date. Mike started to pack the envelope into a sausage at which point a helicopter appeared and circled the field, we gave a thumbs up sign. I was relieved to be on the ground as the wind had picked up even more. A few minutes later another helicopter appeared and circled the field a few times and again we gave the thumbs up and then shortly after that a policeman appeared at the gate to the field. He had been directed by the helicopter to check that we were OK and was very helpful. This was my best long jump flight yet and although not the longest we had again travelled more than fifty percent of the flight over water. Very many thanks to our crew Ian and Hannah Wadey, Celia Morley and Peter Ollivere. Looking forward to next year. Check out The Great British Long Jump at www.thelongjump.com where you can find out all about the challenge get an entry form and read all the illustrated reports. Brilliant stuff.